The porcupine is known to be the prickliest among all rodents. 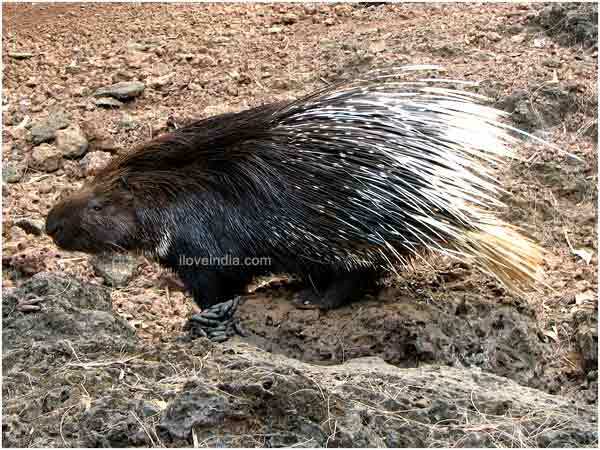 Explore this article to know some more interesting facts and amazing information on porcupines. The term porcupine means 'one who rises up in anger'. Also called quill pigs in Latin, porcupines are short, fat, and covered with over 30,000 spiny quills to protect themselves from predators. These spiny creatures are the third largest rodents, after capybara and beaver. There are over two dozen different species of porcupines. Since porcupines are nocturnal, it's difficult to find them in the daytime, as they prefer to stay in their burrows. But they do come out sometimes, though mainly to sunbathe. Porcupines can swim well across wide streams and lakes, since their quills are hollow and buoyant. They do not shoot their quills; instead, they get dislodged when they shake their tails. Read on further to know some more interesting facts and amazing information on porcupines. Diet: Hemlock, fir, pine, maple, beech, birch, oak, elm, cherry and willow trees in winter. Grasses, leaves, dandelions, pond weeds, water lilies, arrowhead, clover and other wildflowers in summer. Habitat: Pine and leafy forests with rock ledges for dens in the East and dry brushy areas in the West. 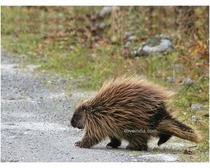 Porcupines live in coniferous and deciduous forests, deserts, rocky outcrops, hillsides and grasslands. They are found in the tropical and temperate areas of North and South America, Canada, Asia, Italy, England and Africa. Porcupines found in the west appear yellow, while those in the east will be dark brown to black in color. Porcupines prefer gnawing food items rich in sodium and sometimes, cause a danger to household items like tool handles, footwear, clothes, etc. They eat a variety of salt-rich plants, like yellow water lilies, aquatic liverwort, fresh animal bones, outer tree bark, mud in salt-rich soils and objects imbued with urine. A newborn porcupine's quills are soft on birth and they harden after about thirty minutes. Female porcupines dominate a territory and defend it against other females, while the male territories overlap those of the other females. Porcupines breed in October and November. When in danger, porcupines produce a rattling noise, by wagging their tail, to defend themselves and raise their sharp, long quills also. One of the few known facts about porcupines is that they turn on their back and make a 'reverse-charge', in order to drive their needle-like quills into their enemy's flesh. The New World or tree porcupines are slow-moving, arboreal animals. Their quills bear minute overlapping barbs, which are difficult to remove when imbedded. 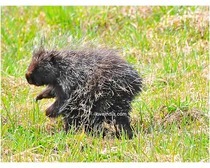 The North-American or Canadian tree porcupines have long, shaggy, brown or black-haired coat, with short quills. They are found spending their day either single or in groups, in rock cavities, hollow logs or burrows. The Central and South-American tree porcupine, also called coendous, has naked-tipped, prehensile tail that it uses to hang from the branches. The Old World porcupines are found in scrubby areas of Asia, Africa and South-East Europe. These porcupines can be recognized by the long black-and-white-stripped quills on the hind part of the back and on the tail. These porcupines are incapable of climbing trees.